NASA?splans for the mammoth Ares V rocket could do more than just launch new lunarlanders and cargo to the moon. It could also haul massive telescopes that dwarf theHubble Space Telescope or fling deep space probes on faster missions to theouter planets. Slated tomake its first test flight in 2018, theAres V rocket is designed to stand about 381 feet (116 meters) tall and beable to launch payloads weighing almost 180 metric tons into low-Earth orbit. ?When it?sbuilt, it?ll be the biggest rocket that?s ever been built,? said Kathy Laurini,project manager for NASA?s Altair lunar lander designed to ride an Ares V tothe moon by 2020, has said. ?It?s quite big.? But whilethe Ares V is designed under NASA?sConstellation program to return astronauts to the moon, the rocket behemothpresents a boon for astronomers and other scientists dreaming of bigger, betterspace-based observatories. ?Thescience community is taking a hard look at Ares V and its capability,? Laurinitold SPACE.com. ?It helps them enable a whole other class of mission.? Thetwo-stage Ares V rocket is designed to launch Altair landers and an Earthdeparture stage into Earth orbit, where they?ll be met by an Orioncrew-carrying spacecraft launched atop a smaller Ares I rocket. 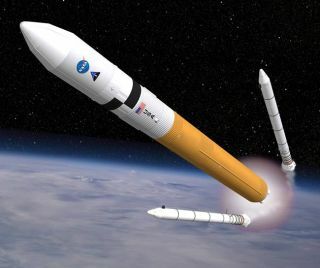 Two 51/2-segment solid rocket boosters derived from the current four-segmentversions that launch NASA space shuttles will help Ares V haul payloadsweighing nearly 396,000 pounds (180,000 kg) - or the equivalent of 17 schoolbuses - into space. "Imagine the kind oftelescope a rocket like that could launch," said Harley Thronson, anastronomer leading advanced concepts in astronomy at NASA?s Goddard SpaceFlight Center in Greenbelt, Md. "It could revolutionize astronomy." Ares V willstand taller than NASA?s last gargantuan booster - the 363-foot (110-meter) SaturnV moon rocket - and will barely fit inside the cavernous Vehicle AssemblyBuilding at the agency?s Florida launch site, NASA officials have said. Itsnosecone is large enough to accommodate eight school buses stacked vertically,and its engines generate enough thrust to launch six times the cargo of a NASAspace shuttle in a space three times larger than an orbiter?s payload bay, they added. A 2008 National Research Council report found that 12 of 17 potentialflagship space science missions could benefit from the repurposing of NASA?sAres V rocket for space missions beyond hauling cargo and landers to the moon. Themissions range from massive space telescopes to planetary probes to the sun, Neptune andSaturn?s moon Titan. The report, entitled ?Launching Science: ScienceOpportunities Provided by NASA?s Constellation System,? cautioned that whilesuch missions could cost more than $5 billion a piece, NASA?s Ares V rocketoffered unique capabilities to launch enormous space telescopes that would humbleHubble Space Telescope and the James Webb Space Telescope slated to launch in2013. "The bigger thebetter," Thronson said. "NASA's new Ares V rocket is going tocompletely change the rules of the game." The roomy 33-foot (10-meter)payload shroud for Ares V allows extra space for space telescopes with largermain mirrors. Hubble?smain mirror, for example, is about 7.8 feet (2.4 meters) across.Ares V could fit an observatory nearly three times larger, like the proposed26-foot (8-meter) Monolithic Space Telescope, which would be able toobserve objects in space 11 times more fainter and with three times thesharpness of Hubble, NASA officials said. ?The 8-meter-diameter telescope can only fit inside an AresV payload fairing,? the NRC report stated. Even larger space telescopes could be packed atop the rocketif their mirrors were folded up for launch, such the 52-foot (16-meter) AdvancedTechnology Large-Aperture Space Telescope (ATLAST) planned by astronomer Marc Postmanof the Space Telescope Science Institute. The optical and ultraviolet lightobservatory could refine the search for habitable planets around distant starsand help better understand galaxy formation around supermassive black holes. "ATLAST would benearly 2,000 times more sensitive than the Hubble Telescope and would provideimages about seven times sharper than either Hubble or James Webb," Postmansaid. "It could help us find the long sought answer to a very compellingquestion, 'Is there life elsewhere in the galaxy?'" Astronomer Dan Lester at the University of Texas at Austinenvisions loading a full 8-meter Single Aperture Far-Infrared Telescope (SAFIR)to probe deeper into the depths of protostars aboard an Ares V, or packing up alarger 16-meter version on the rocket. Anotherproposal by Roger Brissenden of the Chandra X-ray Center includes calls for an8-meter X-ray telescope dubbed Gen-X to hunt for the first black holes, starsand galaxies in the universe. The space-based Chandra X-ray Observatory, forcomparison, has an aperture about 3 feet (1 meters) across. Ares Vrockets also pose a boon for interplanetary missions since the heavy-liftbooster could offer a more direct flight. According tothe NRC report, using the rocket to launch NASA?s proposed Neptune Orbiter withProbes mission could negate the need to use a nuclear-electric engine or useNeptune?s atmosphere for braking during orbit insertion. ?The planetarycommunity?s interested in performance for getting extra delta v to reduce the amountof trip time to the outer planets,? Steve Cookm NASA's Ares project manager at NASA's Marshall Space Flight Center in Huntsville, Ala., has said. Launchinganother mission, the Titan Explorer flight to send an orbiter, lander and blimpto the shrouded Saturnian moon, aboard an Ares V could shorten the years-longflight and allow the probe to use rocket engines, instead of atmosphericbraking, to entire orbit, the NRC report stated. "We could getincredible astronomy from this big rocket," says Thronson, a professionaldreamer. "I can't wait."